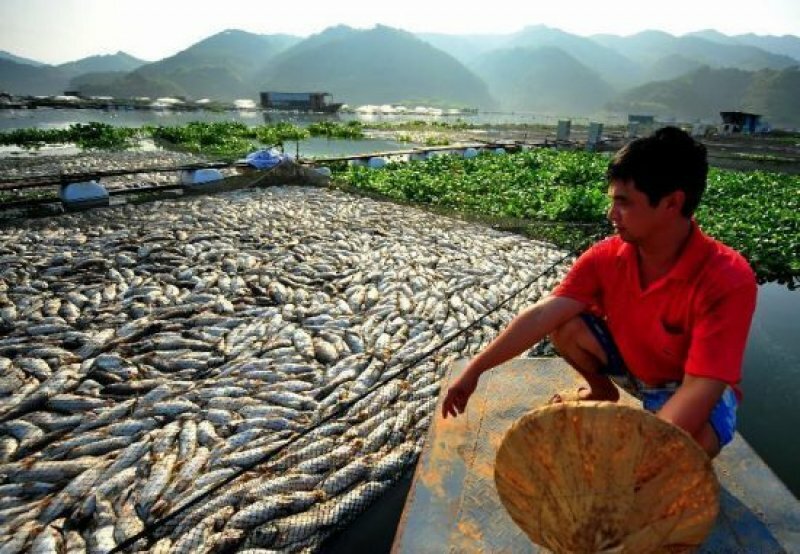 CHINA Millions of dead fish in river water authority claims "is normal"
Millions of dead fish in river water authority claims "is normal"
In the Min River, the main river of Fujian, in the space of a few days tens of millions of fish have died. People block roads to protest against authorities indifference. Gutian County produces over 100 tons of fish a day, now its economy is destroyed. Beijing (AsiaNews / Agencies) - More than a thousand people blocked the main road in Gutian county, Fuzhou, the capital of Fujian to protest the death of millions of tons of fish in the river Min, caused by the discharge of chemical waste. On the night of Sept. 3, clashes broke out when the police intervened to disperse the protest. The Centre for Human Rights and Democracy reports however, that the roadblock continued at least until the morning of September 4. The fish die-off began on August 31 between the city of Huangtian and Shuikou and continued, culminating on September 2 when the Min River was covered in waves of dead fish (see photo). The Xinhua state news agency speaks of more than 8 thousand cases of dead fish in Shuikou and a further 1,000 in Huangtian, but China National Radio speaks of "tens of millions of dead fish", with serious damage to the economy of the area, home to many fish farms. Gutian County, about 100 km from Fuzhou, is renowned as the largest producer of carp and provides every day over 125 tons to fish markets. The Min River is the main river of Fujian, called the "mother river", and is a source of drinking water for millions of people. Pharmaceutical factories upstream are believed responsible for the pollution. But after days of fish deaths, the authorities have only replied that "investigations are ongoing," and while the die-off continued, drinking water managers claimed that there was "nothing abnormal". Then the protest exploded. Residents explain that "the water is black and there is an oily substance on the surface." Many say they indebted themselves to create farms and now have lost their source of income. Several families are already talking of leaving, having no means or will to start again, for fear of other incidents of pollution and that the water has been contaminated. China's rapid economic growth has often occurred without a parallel respect for the environment, with authorities indifferent to serious pollution caused by industries. The population, without and recourse to tutelage, often trigger street protests as the only way to defend their rights. According to a 2011study, in 2009 there were at least 90 thousand mass protests in China, but many believe the figure is underestimated. The government no longer releases official data, after the 80 thousand mass protests of 2007 registered by the Chinese Academy for Social Sciences.